Hidden among dense forests, the settlement at first consisted of only eight houses inhabited by miners and craftsmen brought here from Miedziana Góra. 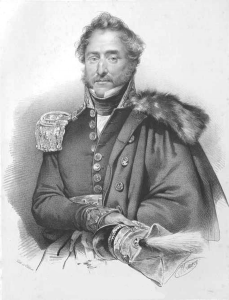 The last treasurer of king Stanislas August, the owner of the lands of Ujazd at the time – Tomasz Ostrowski, discovered there an iron ore deposit and quickly built a furnace for smelting iron ore and two finery forges. Soon the settlement located by the Wolbórka river and near artificial pond was named Kuźnice Tomaszowskie. When in 1817 Ostrowski dies in his palace in Warsaw and the settlement gradually falls into decline, count Antoni Jan decides to rebuild Tomaszów and make it a centre of trade and industry. Craftsmen come from Silesia and not far off Saxony; new trapezoidal market of St. Tekla and rectangular market of St. Joseph with cutting Kaliska street are built. The largest street of the town is closed from the west by a square called Gaworek. Soon afterwards a “so-called” new settlement would be built with the square of St. Anthony in the centre. Names of parallel streets: Mojżesza and Bożnicza suggest the presence of Jewish citizens. Ethnically diverse settlement owes to Antoni Ostrowski “not only industrial and social structure but also its urban planning concept” (Ostrowski 2007: p. 20). This concept was created in 1822 and was recognized by contemporaries as “the most interesting, individualized and reasoned concept in the whole district” (Ostrowski 2007: p. 20). 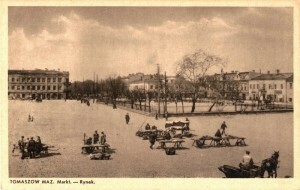 The count – as Krzysztof Dumała noticed – managed knowingly to connect rules of classic city planning (radial structure) with romantic elements (English palace park in the centre). Furthermore, according to the historian, Tomaszów was the only example of eclectic urban composition of industrial centre on Polish lands. Ostrowski himself took a great care of aesthetics while planning his settlement, that is why many German manufacturers decided to settle in Tomaszów, even despite lesser profits than those offered at home. Count Ostrowski observed the beauty of his settlement from the three-storey tower of his palace located in the centre of Tomaszów. “The rumble of the hammers in the forges – wrote Julian Ursyn Niemcewicz, lured to Tomaszów by its attractions – the din of turning mills bloating huge bellows, appearing here and there smoke of furnaces and iron cleaners adorn this delightful settlement” (Ostrowski 2007, p. 22). Painter Piotr Michałowski was a frequent guest of Tomaszów (he was related to count Ostrowski who was his borther and father-in-law). He ran away from the noise of the Warsaw streets and sheltered in the peacefulness of Tomaszów’s landscape. Ostrowski also expected visit from Adam Mickiewicz, whom he dedicated his book about Tomaszów and “the need of social reform” of the city. During his exile the count often recalled Tomaszów describing the town with vivid and a little bit exalted language. The night work of craftsmen was described by Ostrowski with the metaphor of Hephaestus’ forge where the dangerous Cyclops, creators of Zeus’s thunderbolt worked hard. Sparkling and belching smoke city became for the count an incarnation of vitality and life dynamics, while nearby landscapes made the factory face of Tomaszów more attractive. Grubbed forest made space for other settlers brought by Ostrowski and his close associate Jakub Steinman from the whole area of Kingdom of Poland. In 1828 (Witczak 2012: p. 227) this Jew from Ujazd moves to Tomaszów and receives a post of a broker. Not much earlier the municipality office was moved from Ujazd to the annex in count’s palace in Tomaszów. Jewish and German craftsmen come to Tomaszów and settle on both sides of Wolbórka gradually expanding the factory settlement (called this way in 1824). Over the years Tomaszów becomes an important textile centre with many new workshops catering not only Kingdom of Poland, but also oriental markets. Abram Judka Elbinger invited by Ostrowski from Warsaw builds new factories in Tomaszów and produces linen and cloth. Jakub Joachim Kempner, one of the most wealthy citizen of Tomaszów at that time, leases steel plants and significantly increases the production of iron ore (Witczak 2012: p. 133). Beside manufacturers and craftsmen (tailors, carriers, cobblers, carpenters, chandlers, barkeepers) many doctors, rabbis and artists arrive. More prosperous immigrants mix with poorer Jews coming from nearby villages forming heterogeneous, multicultural Tomaszów. The majority of permanent residents were Germans (38,4%) – owners of textile mills, followed by Jews (32,8%) – merchants and craftsmen, and Poles (28,8%) – owners of real estate (Leszczyński 2004: p. 10). Ostrowski took care of each citizen regardless of their religion, contributing to the development of religious communities (catholic, protestant and Jewish). He relocated a small catholic church from village Tobiasze to Tomaszów, he began building churches and synagogue, he also founded schools. First school taught children of various religions. The function of the principal was carried out by a young Piarist, father Wojciech Klonowski, local rector and recognized educator (Leszczyński 2004: p. 10). Tomaszów becomes cultural and religious melting pot where newcomers from distant locations coexist adding the town a heterogeneous appearance. Together with the development of trade and industry a new brewery is built – “Tanzbuda” hosting dance, music and theatre shows (Topas-Bernsteinowa 1898: p. 11). „It’s a charming place this Tomaszów, before the sunset, when this fire ball diving in clear waters gives to all surrounding objects these lights – not easy to convey with a pen not even with a dexterous paintbrush, these shadows, these various colours (…). I received both English and Swiss and different sightseers, nature lovers; they admitted rarely seeing that kind of charm and uniqueness; nothing more pleasant than navigating the lake (Ostrowski 1834: p.123). Ostrowski emphasizes that Tomaszów raised from poverty, „almost from nothing”, that many economists predicted failure of the settlement. On the other hand first foreign Christian settlers asked their host not to accept too many Jews. “Why not? – he would ask – why in the new settlement there is supposed to be no Jews?”. The answer of citizens revealed stereotypical image of Jews, who “brake everything, buy, bribe and cheat”. Although Ostrowski saw grains of truth in these prejudices, he was aware of the great potential of Jewish settlers, especially if it comes to merchandise. Therefore he ordered the right to free competition which induced an inflow of settlers of different nationalities. This is how he won many manufacturers, drapers, soon many new manufacturing plants were built. Ostrowski reacted very quickly to the economical problems of his citizens. To make their earnings easier he built “a little colony” called Precz-Bieda (“step-back poverty”) which in two years turned into a “built-up village” and a kind of suburbs. That is how both rich and poor Jews found their place in Tomaszów. “The first ones worked with their industries, capitals, the latter – with their hands: no one sat still”. The poorest were employed in manufacturing plants. New taverns and inns were opened, “bridges pulsated on swooshing Wolbórka”. Closing story of Tomaszów’s Jews Ostrowski confessed: “I will add, that several years of their stay under my supervision left a thorough impression, that in every trait those people can be civilised, moralized, especially youth, the most numerous in Tomaszów. More than a half of them have already dropped the old-fashioned clothes of Polish Jews, they have shorter payots, they cut beard shorter so that there is a slight difference between them and these Christian beaux of Tomaszów, who grow their beards to be fashionable; the caftans gave way to coats, frock-coats (…)” (Ostrowski 1834: p. 169).